Added by Indo American News on June 19, 2014. From left: Organizers Mukulesh and Upma Shah, Nadeem Asharafi from heartbeat group, Singer Dr. Veena Watve and her son Rohil and Nitish Kulkarni. 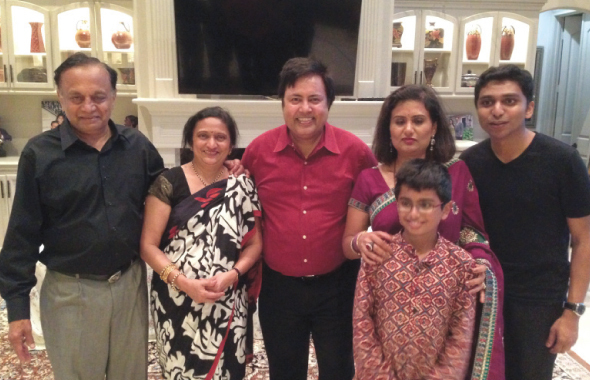 SUGAR LAND: Although it was Father’s Day on Sunday, June 15, almost sixty people gathered at 3:30 in the afternoon at the home of Mukulesh and Upma Shah for a special musical treat. The program was “Ek Sham, Asha ke Nam”, a glowing tribute to the playback legend Asha Bhosle who has rocked Bollywood for over 45 years with bhajans, pop songs, night club music, mujara and other teasers. The beautiful voice of Asha was rendered by a dedicated singer, Dr. Veena Watve who could have made a career singing the over 11,000 songs of Asha Bhosle. Instead, she has dedicated her career to becoming an Endocrinologist practicing in the North Cypress part of Houston! How she balances her professional career with her passion for music and excels so well is a mystery. She is a rare combination of grace, beauty and intelligence. She was accompanied by Nadeem Asharafi, the pride of Houston’s Heartbeat Group on keyboard, and one of the youngest and accomplished tabla player, Nitish Kulkarni. All the three had one thing in common – they all started learning music at a ripe young age of five! Viju Bhadkamkar, who has known the Mangeshkar family for decades, and who has personally known Asha Bhosle for decades, was the emcee. She sprinkled the program with many tidbits that most people in audience did not know. It contributed to the success of the evening. And last but not least, Meenaben Kapasi sang and recited the Jain Sutras, including Navkar Mahamantra and Shantipath. Upma Shah’s strict guidelines about the conduct of the audience during the program encouraged a sense of discipline but she emotionally melted away when she introduced her sister, Kumkum and her husband Prakash Doshi who were visiting the Shahs from Mumbai. The evening ended with an excellent dinner and other socializing. One of the silent heroes was Mukulesh, who worked very hard to take care of all the guests in the VIPs although he could have relaxed on Father’s Day. Once again, the undying passion of Upma and Mukulesh Shah in helping promote local talent and turn this Father’s Day evening into a memorable experience.